‘E NO DEY SWAY’ – BRAND NEW SINGLE FROM FUNKE AKINOKUN FEATURING IBITAYO JEJE. Whaow! Funke Akinokun is back with a bang this 2016. The veteran praise and worship ambassador releases a brand new single titled ‘E No Dey Sway‘. An amazingly beautiful Highlife danceable praise song that just makes you get up on your feet. The song ‘E No Dey Sway’ exalts God by talking about His faithfulness, love, and consistency in our lives, inspite of our daily human inconsistencies and falls. To make matters even better, Funke Akinokun (@Funkeakinokun) decides to collaborate with her sister, friend and Highlife Queen, Ibitayo Jeje (@IbitayoJeje) on the song. Funke Akinokun delivers an effortless vocal performance on this song which she wrote, and Ibitayo Jeje brings her usual swag to the song. Funke Akinokun, the lady who gave us the various Names of God in several languages in the song titled ‘Who You Are’, is a global ambassador of gospel music, and one proclaiming the Name of Jesus Christ as her personal Lord and Saviour. Her music is an evangelism tool that she hopes will allow the word of God reach more people globally. So while listening and dancing to the beautiful music produced by the Multi Awards winning music producer Wole Oni, you will find conviction in the words that make up the song. 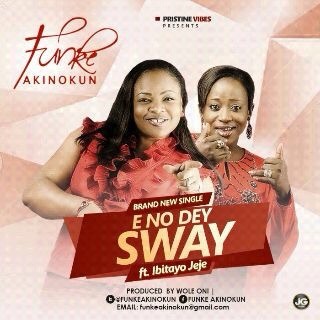 Do download and enjoy this new single – ‘E No Dey Sway’ by Funke Akinokun featuring Ibitayo Jeje, and please send to your friends and loved ones, so that it can bless more lives. God is Faithful.